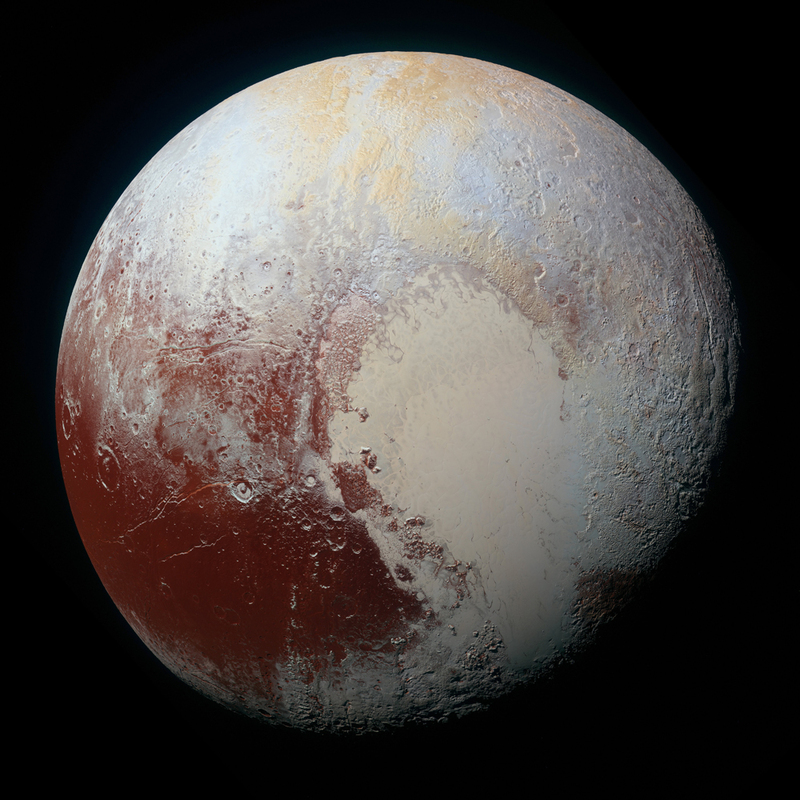 In July NASA's New Horizons spacecraft flew within 7,700 miles of Pluto, a close encounter that lasted mere hours. In that short time, preliminary images sent back to Earth just after closest approach grabbed our attention and captured our imagination in profound ways. Our vision of Pluto went from being a fuzzy, blurry disk to crisp and colorful vistas of what has turned out to be a highly complex and unique world. But the adventure of exploring Pluto and its system of moons was only beginning and continues to unfold even now, as New Horizons' mass of flyby data is transmitted slowly back to Earth, where scientists will spend years analyzing it. 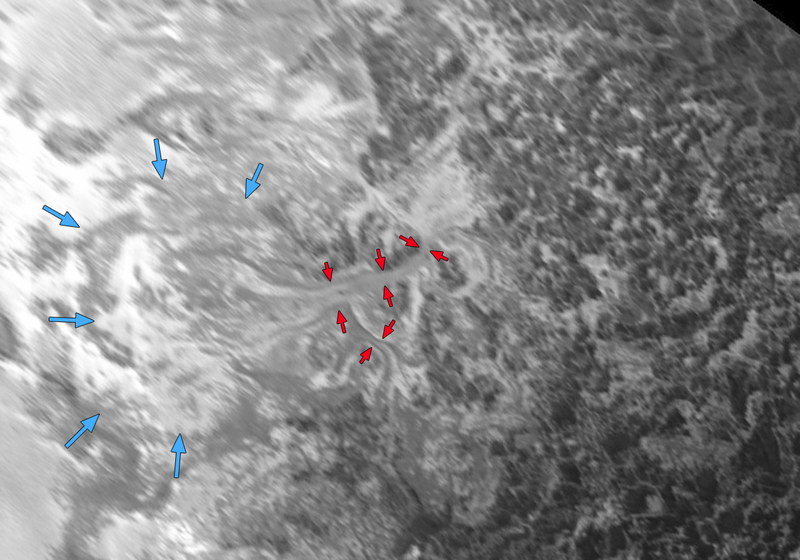 Are Glaciers Flowing on Pluto? A giant heart-shaped region, named Tombaugh Regio (in honor of Pluto's discoverer, Clyde Tombaugh), presents vast sheets of icy plains that bear little or no evidence of impact craters, suggesting that its gleaming white surfaces are relatively young. 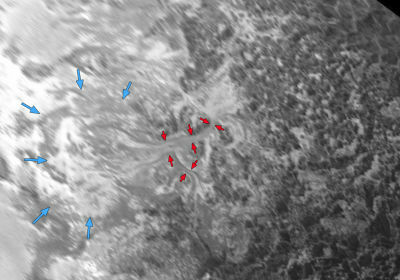 Some areas of the smooth plains possess patterns reminiscent of glacier activity, with masses of accumulated material apparently flowing between hill ranges to flood lower terrain. New Horizons detected frozen nitrogen, carbon monoxide and methane in these plains of ice, which could help explain any active glacier flows there. 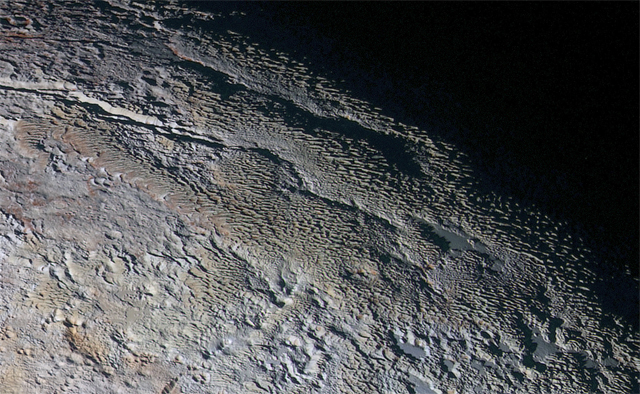 While water ice in Pluto's extremely cold temperatures should behave as solid rock does on Earth, these exotic ices may be able to flow in glacial "rivers." Towers of Ice Miles High? Also found within Tombaugh Regio are two significant ranges of mountains, the highest peaks reaching over two miles into the sky. Their light coloration suggests that they may be composed largely of water ice. On Earth, the warmer climate and much stronger gravity prevent solid ice from rising so high. On Pluto, nature allows such possibilities. 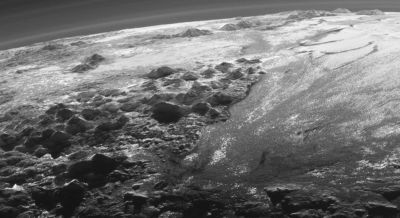 Pluto's atmosphere was found to be more extensive and complex than thought, and composed of nitrogen, carbon monoxide and methane. The fact that frozen forms of these chemicals have been found in Pluto's ice plains points to a possible dynamic interaction between surface and atmosphere. 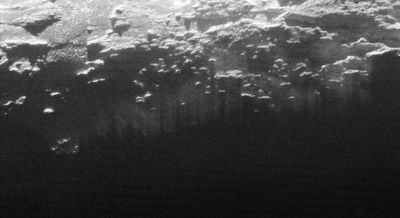 Giving the impression of the skin of an onion, Pluto's atmosphere is defined by layers of haze, the highest layer detected about 80 miles from Pluto's surface. The haze is composed of hydrocarbon particulates, including methane, ethylene and acetylene. Low-lying shrouds of surface haze, or perhaps "fog," have been seen hugging the ground in images side-lit by the sun's twilight rays. A surface texture dubbed "snake skin" is puzzling scientists. 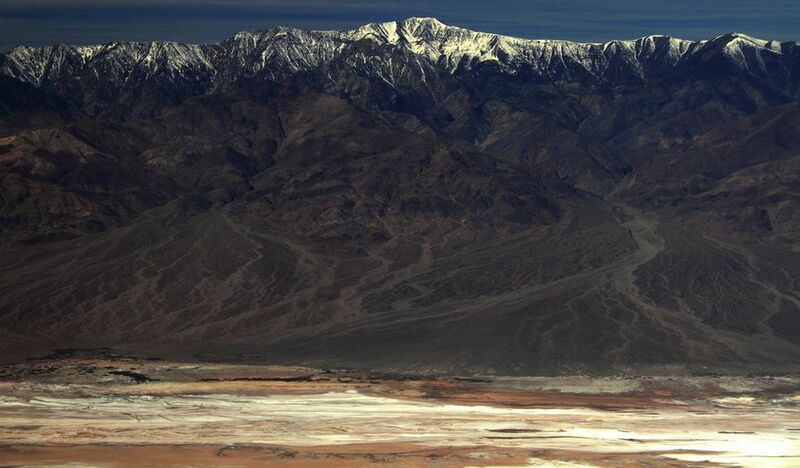 Composed of linear, rounded, bluish-gray ridges with a reddish filling between, the complex and so far unexplained terrain presents the appearance of reptilian skin, like an alligator or snake. Further analysis of New Horizons' data in the months ahead may give us a better understanding of what forces have shaped this terrain, but for now Pluto's "snake skin" is symbolic of the fact that we are still exploring, still learning and still discovering the beauty and wonder that is Pluto. Before New Horizons, artists depicted Pluto's landscapes with rolling hills of ice, frosty plains and tiny moons set under brilliant stars—a palette of landforms and skyscapes that took into account our scant knowledge of this distant, cold and tiny dwarf planet. 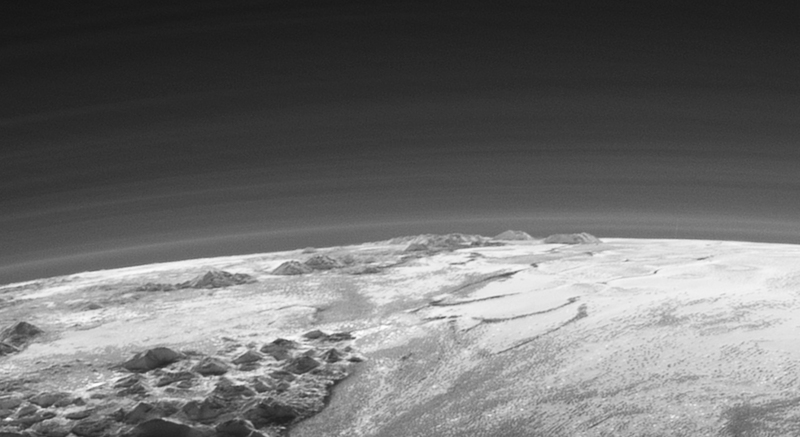 Now, envisioning the vistas we might behold if we could stand on Pluto's surface has taken on an entirely new dimension. New Horizons is delivering to us knowledge of unearthly landscapes that we never dared to expect.